A Summary Link Web Part and a Summary Link field control both provide an easy way to build a page of links to various resources, both inside and outside of your site. You can control the appearance, organization, and presentation of the links that you add to a Summary Link Web Part or field control. 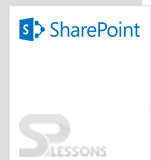 Go to the sharepoint site page click Edit Page. Choose a zone for the Web Part, and then click Add a Web Part in that zone. The Add Web Parts Web Page dialog box opens. In the Add Web Parts dialog box, here select the Content rollup Web Parts, in the Default section, select the Summary Link Web Part check box, and then click Add.